St. Paul, Minn., December 7, 2017 – PolyMet Mining Corp (“PolyMet” or the “company”) TSX: POM; NYSE AMERICAN: PLM – today reported that it has filed its financial results for the three and nine months ended October 31, 2017. PolyMet controls 100 percent of the development-stage NorthMet copper-nickel-precious metals ore body and the nearby former LTV Steel Mining Company site, located near Hoyt Lakes in the established mining district of the Mesabi Iron Range in northeastern Minnesota. The financial statements have been filed at www.polymetmining.com and on SEDAR and EDGAR and have been prepared in accordance with International Financial Reporting Standards. All amounts are in U.S. funds. Copies can be obtained free of charge by contacting the Corporate Secretary at First Canadian Place, 100 King Street West, Suite 5700, Toronto, Ontario M5X 1C7 or by email at info@polymetmining.com. In August, the Minnesota Department of Natural Resources (“MDNR”) released six draft water appropriation permits for 30-days of public review and comment. In September, the MDNR released two draft dam safety permits for 30 days of public review and comment. In November, the U.S. House of Representatives passed bipartisan legislation introduced by Rep. Rick Nolan, D-MN-8, directing the secretary of agriculture to move forward with the land exchange between PolyMet and the U.S. Forest Service. This bill has advanced to the Senate for consideration. Transfer of title to the surface rights over and around the NorthMet mineral rights to PolyMet as part of the authorized land exchange. Favorable decisions by the state on 401 Water Quality Certification and U.S. Army Corps of Engineers Final Record of Decision and 404 wetlands permit under the Clean Water Act. Publication of draft state Permit to Mine, National Pollution Discharge & Elimination System water discharge permit and air permit for public comment. Favorable decisions on state permit issuances (Permit to Mine, air, water and dam safety permits). Completion of definitive cost estimate and project update following permits. Completion of project implementation plan. Repayment, restructuring and/or conversion of Glencore loans. Completion of construction finance plan, subject to typical conditions precedent, such as receipt of key permits. At October 31, 2017, PolyMet had cash of $11.248 million compared with $18.674 million at January 31, 2017. The company is in discussion with Glencore regarding the convertible and non-convertible senior secured debentures currently due to be repaid upon the earlier of availability of construction finance or March 31, 2018. As of October 31, 2017, PolyMet had spent $127.134 million on environmental review and permitting, of which $120.683 million has been spent since the NorthMet Project moved from exploration to development stage. Loss for the three months ended October 31, 2017, was $2.251 million compared with $2.094 million for the prior year period. 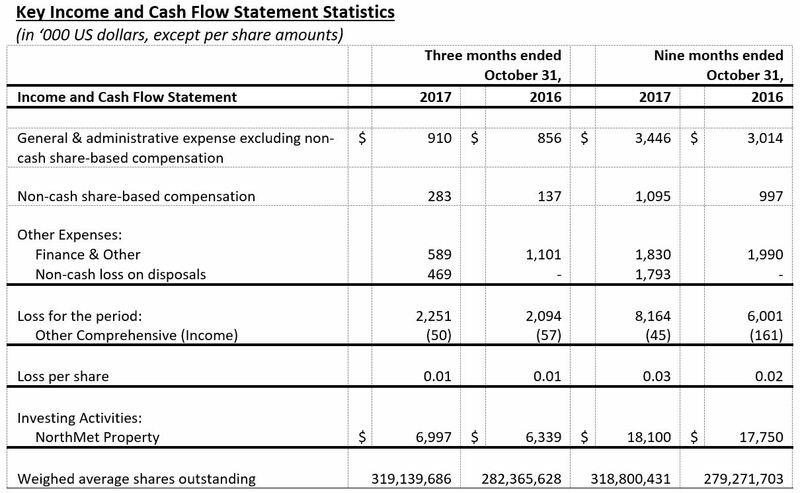 General and administrative expenses for the three months ended October 31, 2017, excluding non-cash share-based compensation, were $0.910 million compared with $0.856 million for the prior year period. Other expenses were $1.058 million compared with $1.101 million for the prior year period. Loss for the nine months ended October 31, 2017, was $8.164 million compared with $6.001 million for the prior year period. 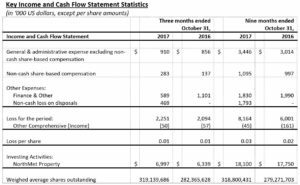 General and administrative expenses for the nine months ended October 31, 2017, excluding non-cash share-based compensation, were $3.446 million compared with $3.014 million for the prior year period. Other expenses were $3.623 million compared with $1.990 million for the prior year period. PolyMet invested $6.997 million cash into its NorthMet Project during the three months ended October 31, 2017, compared with $6.339 million in the prior year period, and invested $18.100 million during the nine months ended October 31, 2017, compared with $17.750 million in the prior year period. The company further reports that the board of directors has agreed to change the company’s financial year-end from January 31 to December 31 to better align with industry peers. The company’s transition year will consist of an eleven-month period ended on December 31, 2017. For more details regarding the length and ending dates of the financial periods, including the comparative periods, of the interim and annual financial statements to be filed for the company’s transition year and its new financial year, please refer to the company’s Notice of Change of Year End filed pursuant to National Instrument 51-102 and Management Discussion and Analysis for the three and nine months ended October 31, 2017. The Notice of Change of Year End is available on SEDAR. The Management Discussion and Analysis is available on SEDAR and EDGAR and on the company’s website at www.polymetmining.com. PolyMet Mining Corp. (www.polymetmining.com) is a publicly traded mine development company that owns 100 percent of Poly Met Mining, Inc., a Minnesota corporation that controls 100 percent of the NorthMet copper-nickel-precious metals ore body through a long-term lease and owns 100 percent of the former LTV Steel Mining Company site, a large processing facility located approximately six miles from the ore body in the established mining district of the Mesabi Iron Range in northeastern Minnesota. Poly Met Mining, Inc. has completed its Definitive Feasibility Study. The NorthMet Final EIS was published in November 2015, preparing the way for decisions on permit applications. NorthMet is expected to require approximately two million hours of construction labor, create approximately 360 long-term jobs directly, and generate a level of activity that will have a significant multiplier effect in the local economy.